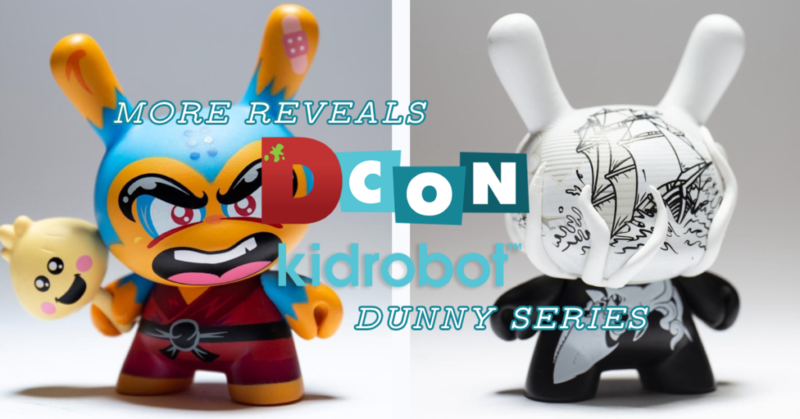 More Reveals of the DCon Kidrobot Dunny Series! As the waves draw ever closer to DesignerCon, we are getting more & more reveals of the DesignerCon Kidrobot Dunny Series that will be debuting next Friday 16th in Anaheim at the DesignerCon 2018 extravaganza! Today we caught the first glimpse of The Kraken by Jon-Paul Kaiser. JPK has a reoccurring nautical tale of the Whispering Corsair Sail crew which translates to this DCon Dunny. In this scene, the crew is being attacked my the legendary Kraken. Its giant tentacles towering above the ship, prepared to crash down with all their might! No mercy for the mightiful! We also have the reveal of the Shao Ru Dunny by Hyperactive Monkey!! Shao Ru lives in the land of Hypertopia, home to all of the Hyperactive Monkey characters. Each colourway (!!) of Shao Ru embodies all the things Jerome Lu loved the most during childhood; Kung-fu, zombies, and cyborgs. Although Shao Ru is a master of martial arts, he spends most of his time eating (that’s why he comes with his favorite veggie dumpling). He also has bandaids on his head from all the times he rolls off his bed while he is sleeping (not from fighting). Super sweet design from Jerome! A great addition to this series! Celebrating the rich history of DesignerCon, this new Dunny series features artists and designs by @craola, @deph, @jonpaulkaiser, @hyperactivemonkey, @kanokid, @flatbonnie, @chetzar, Paul Frank, Christopher Lee and @ragnarsquad. Kidrobot are slowly releasing information & images for this wonderful new series. We also have the DCon Vincent Mascot by Mr Scott Tolleson, The Jewel Guardian by Christopher Lee and Black Magick design by Chet Zar (which you can see further down this post). This is turning into a really impressive Kidrobot Dunny Series! Don’t ya think?! We’ve said it once and we’ll say it a thousand more times before next weekend, if you’re heading to DCon next Friday (16-18th Nov) grab your tickets in advance HERE. See you down the front!